I have no idea what I will be doing on a Wednesday in three weeks time. I don't know if I will have to work late, go for an appointment or take my car to get fixed. I might have to do something with my family or friends, or I might just be sore from a previous run. So there is no point in making a schedule that is set in stone. I need to be flexible. I need to be able to move runs around to fit my life, not the other way round. I'm not a full time professional runner, I still haven't been asked to compete in the Olympics and my sponsorship deals still remain at zero. I like running magazines. I buy Runners World every month. They are a great source of information and inspiration, but they are not always realistic. They are written by people who's life revolves around running simply because of the work that they do. They will always have a good looking fitness model on the front cover dressed in the best gear, running in the most picturesque of places. It is their aim to sell the dream that we can be just like them. Beautiful, in the best shape and happy to be running over sun drenched terrain that I only ever see on holidays. The camera adds 39 pounds.. The picture above would not make it onto any running magazine. Unless a new magazine called "Overweight Cold Runners Monthly" goes into print, in which case they can use this for the front cover. As unflattering as this picture is, it is also real life. It was taken on my last run which you can read about in My Half Marathon Training Begins. It was cold, I have about five layers of tops on and my legs were tired from work earlier that day. It was also done in between going to a doctor's appointment and getting some hay for my girlfriend's horse before it got dark. Don't get me wrong, I'm not as miserable as the expression on my face might suggest. 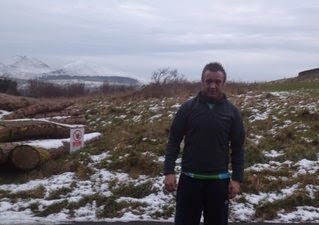 I was sweating after running a very enjoyable few laps of Castlewellan Lake, and I was also pleased with my performance. But it has to fit in with everything else. Whether that is the cold weather, ice, snow, work, appointments or any of life's other commitments. So that is why I have to think differently about my training programme. It needs to be flexible, but also keep me on track to get close to my sub 1 hour 25 minute half marathon goal. I will be accessing my performance at the end of every week, and using this to help me plan for the week ahead. I think this is a much more sensible and sustainable approach. 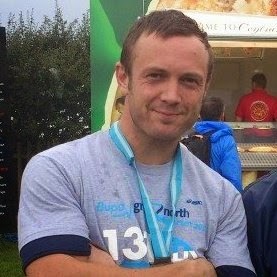 Each week I aim to include a speed run, a half marathon pace run and a slower long run. I'll follow the long run with a recovery run the next day. I've also got a few races included so I will have to move my long runs to midweek when these are taking place. Four running sessions a week should be enough, especially as I spend all day in work walking and running. And if I need to take a break at any stage I will. Just as long as it's for a genuine reason, and not just an excuse of it being too wet, cold or any other excuse my brain can conjure up. I will try and get a stretching activity in once a week like yoga or the Insanity Recovery DVD, but if one of these has to be missed then they will. The same goes for any Insanity workouts. If I have the time and energy I will do one, but if I don't then the actual runs should take priority. It's all about the running now and just being able to fit them in as best as I can. I will post up my running activities every week, but there is no point me typing a nine week training schedule as I have no idea if I will do everything just as it says. Maybe they work for you, but I think this way will work better for me. If you want to keep up to date with all my training for the next eight weeks, enter your email address into the email sign up on the side bar, or at the very bottom of this page.. You'll receive a weekly email with links to all my training and posts, with absolutely no spam.. You can also cancel at any time.